Western nations have been struggling with how to respond after Malaysian flight MH17 was shot down Thursday [17th July]. No-one has claimed responsibility, but Russian separatists are widely believed to be responsible. Given the height the commercial passenger plane was travelling it is also suggested that the aircraft was shot down with the aid of Russian technology. But while all the evidence seems to point to Russia and pro-Russian separatists, the West is unable to respond with anything more than harsh rhetoric. US President Obama, the British Prime Minister David Cameron and others were quick to talk of finding "those responsible" and to "bring them to account". However, even if it is proved that pro-Russian separatists were responsible and supplied with Russian missile technology, there may be little they can do, lest they provoke the angry Russian bear. There has been talk of increased sanctions. However this could hurt the West, and Europe in particular, far more than Russia. Much of eastern Europe cannot survive without Russian gas supplies and there is the distinct possibility Russia could turn off the taps. Whilst Russia would lose out economically, it would still have markets such as China. London is awash with Russian billions, much of it ill-gotten and laundered in the City but ultimately bringing wealth to the UK. Sanction could also damage companies like BP who own massive stakes in Russian firms. There have been many flippant remarks on social media suggesting the West 'nuke Russia'. But military action is something few leaders in the West would contemplate [The Mirror]. A ground offensive would be costly, both financially and in terms of lives. Even targeted strikes, with drones, missiles or military jets, could result in an escalation of hostilities which could drag the West into a war with Russia. Whilst even Russia might baulk at the use of nuclear weapons, military intervention with the likes of Putin could prove very dangerous, especially if he has no absolute control over his military. 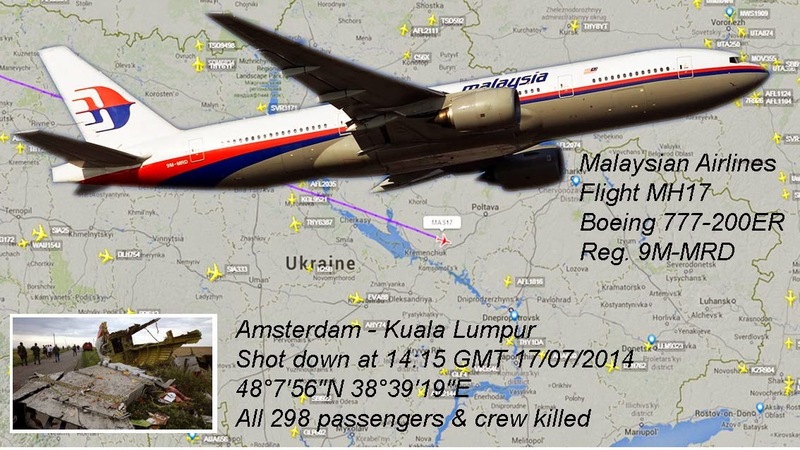 The shooting down of flight MH17 was likely an error. Separatists on the ground may well have believed the plane was a Ukrainian military transporter. But without the command structure and an ability to properly verify the fact with technology normally available to nation states, the decision was made merely on supposition rather than absolute facts. Posts on Russian social networks seem to indicate that pro-Russian separatists genuinely believed they had identified, targeted and shot down a Ukrainian transport plane. At 13:50 GMT on Thursday a message was posted on the Russian social network VKontakte. The message, on an account believed to be linked to a pro-Russian separatist leader in Ukraine, Igor Girkin (Strelkov), claimed that militants had shot down at least one Ukrainian military plane near the Donetsk Region town of Torez, possibly two. The post was soon deleted, but not before screengrabs were widely disseminated around the globe [BBC / Censor]. There was also evidence seeming to show that a BUK surface-to-air missile launcher was quickly moved following the shooting down of MH17. In a day of claim and counterclaim, Ukraine's interior minister Arsen Avakov said a BUK mobile launch vehicle had been moved since the destruction of the Malaysian Airlines Boeing 777-200 on Thursday, and that it was missing at least one rocket, suggesting it had fired at the jet killing all 298 aboard. The minister claimed the launcher had been tracked by Ukrainian intelligence agents as it passed by the town of Krasnodon in Luhansk region on its way to the Russian border. A 13-second video showed a tarpaulin-covered vehicle being driven through a semi-rural location with green and white missiles still visible, but it was not possible to confirm the veracity of the claim. Nonetheless, the later deleted claim of downing a military plane, video of what may be a BUK M2 SAM system and suggestions that at least one of the plane's black boxes had been recovered by separatists and was being taken to Russia, all seemed to point to one conclusion [Daily Mail / Telegraph]. Many papers in the West were clear in their assessment. Friday's Sun newspaper pointed the finger at the Russian President with the headline "Putin's Missile". The Daily Mail said all the evidence, including footage and intercepted radio transmissions, "proved" the pro-Russian separatists - helped by Russia - were responsible. None too happy about the reportage in the West, Russia's state media and others have been attempting to counter the accusations. Russia Today was putting out what was widely regarded as propaganda, enticing one journalist to quit [Channel Four News]. Meanwhile the Russian government was accused of attempting to alter Wikipedia entries in an effort to remove criticism [Telegraph]. There was some criticism of Malaysian Airlines too. Despite flying at more than 10,000 metres [33,000 feet], supposedly out of range of missile systems, there have been many criticising the decision to continue flying over a known warzone. However there has been only advice issued from various bodies concerning the use of Ukrainian airspace, and whilst some airlines halted flights over the region some months ago, others have continued to fly across the country. Since Thursday's shooting down of MH17 most airlines have now decided to avoid East Ukraine altogether and EuroControl issued a statement saying that all flights filing a flight plan through the region would be rejected. This weeks events may bring little or no retaliation concerning the separatists and possible Russian involvement in supplying weapons. But there will certainly be repercussions in the rules and restrictions applied to civilian aircraft flying over or near conflict zones. The real tragedy is that 298 people have lost their lives in order to bring about a rethink in the way such rules and regulations are implemented. Do UK govt surveillance laws go far enough?